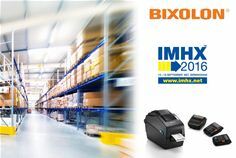 IMHX (13-16 September 2016, Birmingham, UK) – BIXOLON (stand 8A10), the global manufacturer of advanced Receipt, Label and Mobile Printers will be showcasing its leading range of robust Label, Auto-ID and POS printing solutions for the transport and logistics markets at IMHX 2016. Demonstrating the latest in logistics printing technology, BIXOLON will be making a number of announcements at the show including the launch of the NEW SLP-TX220 2” (58mm) Thermal Transfer Label Printer with built-in Bluetooth, featuring Apple MFi iAP2 certification. Alongside the NEW SLP-DL410 4” (110mm) Direct Thermal, fan-fold label printer with Smart Media Detection™. Delivering product innovation, BIXOLON will be showcasing two NEW sleek & lightweight mobile printers, the SPP-R200III and the SPP-R310 featuring cutting edge NFC auto-pairing technology. These next generation receipt, ticket and label printers complement BIXOLON’s existing range of 2” and 4” mobile printers, ideal for warehouse printing management, invoicing or card payment solutions. BIXOLON will also be exhibiting the SRP-380 3” (80mm) super-fast POS printer, the first in the world with a 5 year warranty and the brand NEW SRP-300 liner-free label and receipt printer. Alongside BIXOLON’s NEW B-gate mPOS hub solution which easily connects standard POS peripherals with tablets or smart devices via its powerful Bluetooth or Wi-Fi interface.